JLA Music - The Major Pentatonic Scale: What Is It, What Is It Used For, and How Do I Play It? The major pentatonic scale is one of the simplest scales, having only five different letter names - hence the prefix "penta" as in "pentagon". It is easily constructed by removing the fourth and seventh scale degrees of a major scale. These two notes are often the most active and dissonant notes, occurring only one half step from the third and first (eighth) scale degrees, so removing them solves some otherwise vexing problems. The major pentatonic scale is widely used in Western and Eastern music to create melodies and harmonies. Although highly stereotypical, the following music example is widely known and often heard in movies and television. I almost hesitate to use it, as it has become hackneyed with overuse, but it is one of the most recognized melodies that uses the major pentatonic scale. The major pentatonic scale is utilized often when improvising, especially in pop, blues, jazz, and country music. It works especially well in the country genre, giving it a "countrified" feel. Used over major chords and in major keys, it works almost flawlessly. For example, in the key of C major, the I, ii, iii, IV, V, vi, and viio chords all use notes that are in the C major pentatonic scale. 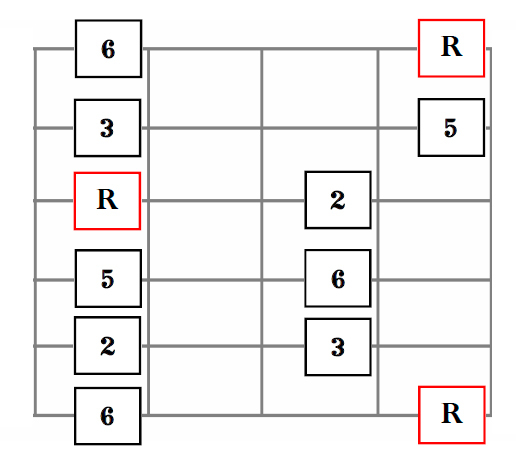 This diagram shows the diatonic chords (chords within the key) in the key of C major compared with the notes in the C major pentatonic scale. 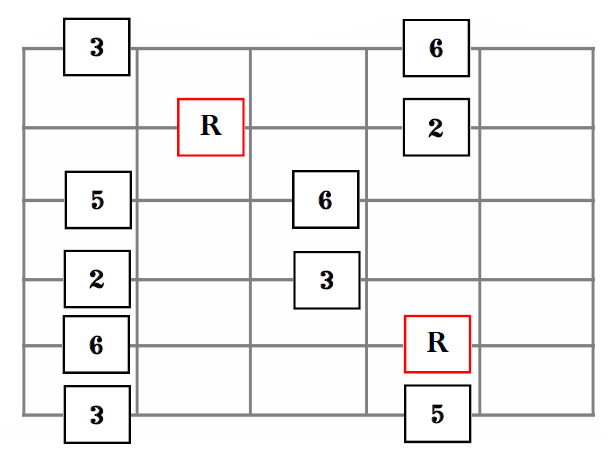 Notice that all of the chords have notes found in the C major pentatonic scale. 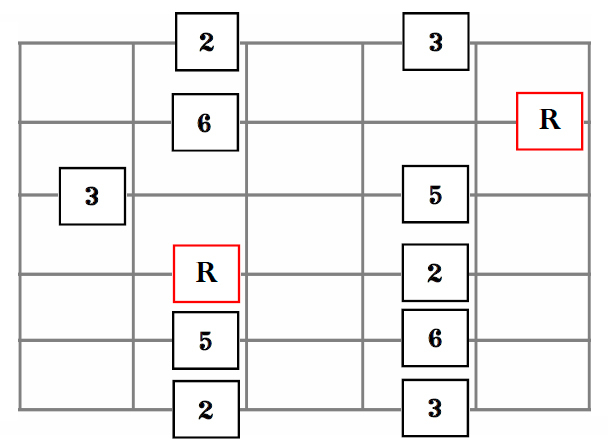 B diminished (Bo), a relatively rarely used chord, is the only one that has only one note. This makes it fairly difficult to play a "wrong" note (colored black) when using the major pentatonic scale to improvise over the diatonic chords in a major key. 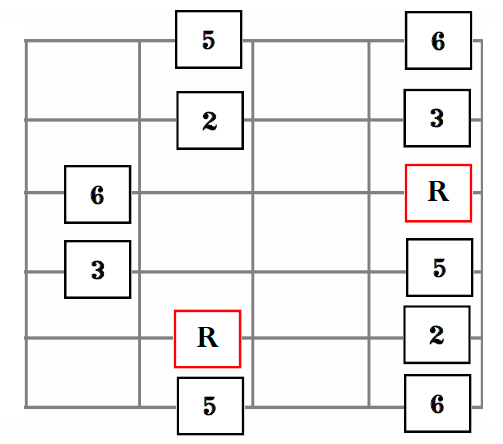 In certain improvisatorial contexts this scale can be used as a substitute for the minor pentatonic scale. For example, utilized judiciously in the blues, it can add some "spice". This scale is easily played on any instrument by simply removing the fourth and seventh notes of a major scale. Guitarists often prefer to memorize scale shapes, so I have included the five shapes that most guitarists play below. 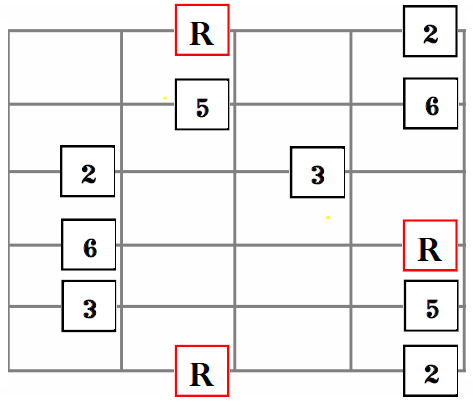 (The numbers in the squares refer to scale degrees of the major scale from which the major pentatonic scale is derived, while the letter "R" is the root, or key note, of the scale. Guitar players often refer to the key note of a scale as the root, though the more correct term would be "tonic". Chords have roots while scales have tonics.) You may also download a pdf file that includes the five scale forms, along with a short introduction, by clicking here. A slightly altered full fingerboard layout of all five scale forms is included at the bottom of this article.